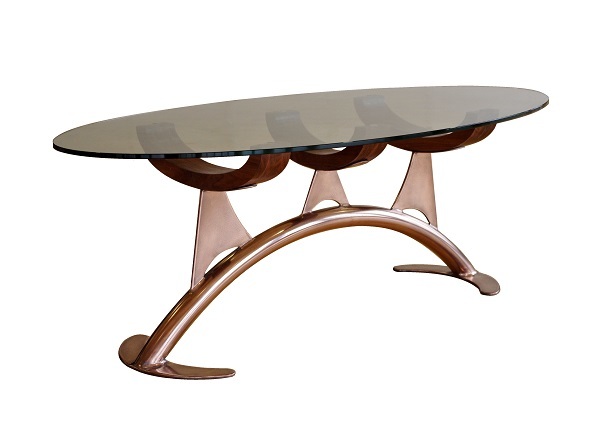 This oval glass coffee table is a striking piece. 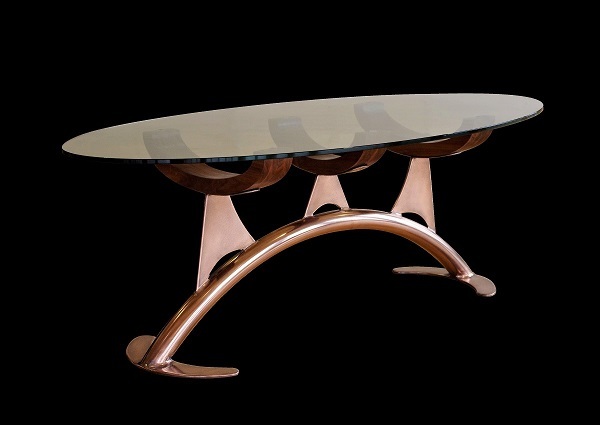 Combining a mix of wood, metal and glass, this bespoke oval table ticks all the boxes when it comes to contemporary designer furniture. A glass table is a good choice if you want to keep your home light and airy. The transparent oval glass allows light to flow and helps keep an uncluttered and bright feel. If you are looking to achieve modern contemporary look, then this may just be for you. You can choose which combination of wood and metal finish you would like, to help match with existing furniture and fabrics. The sweeping supporting metal base can be finished in either warm metallic bronze or copper or in cool contemporary mirror polished stainless steel. Then the solid wood glass supports come in a choice of walnut, oak or maple. If you would like a different wood choice then we will be happy to discuss with you and recommend an alternative. Finally, an elegant 12mm toughened oval glass top adds the finishing touch. The ‘Bone’ will make an elegant centre piece in any living space, be it living room, hallway or bedroom. This is a stylish contemporary designer coffee table with nautical undertones is carefully handmade to your specifications. 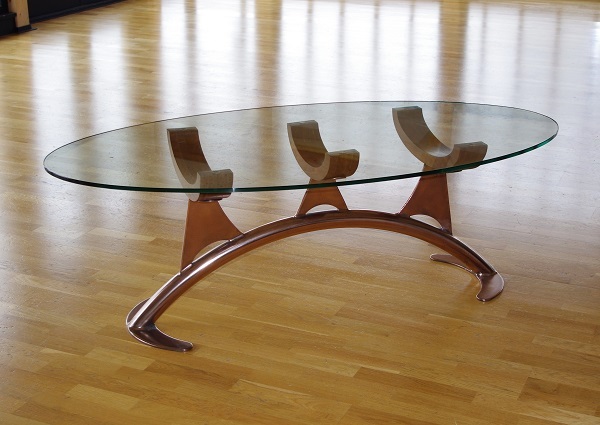 Oval glass top dimensions are – length 160cm and width 80cm. The table height measures 53cm. 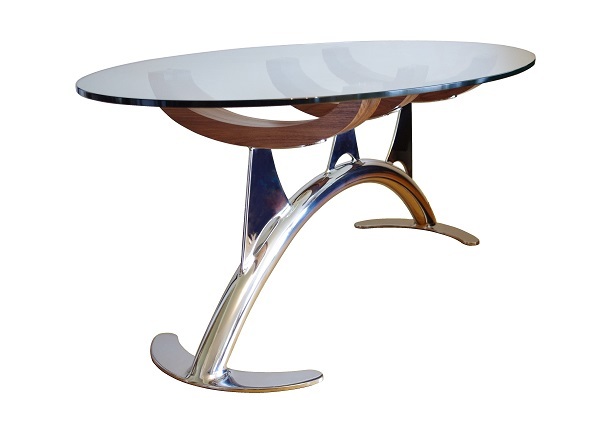 Coffee table base is of steel construction and is available in mirror polished stainless steel and bronze, or copper finished. Wood supporting ribs – choose from solid oak, walnut or maple . 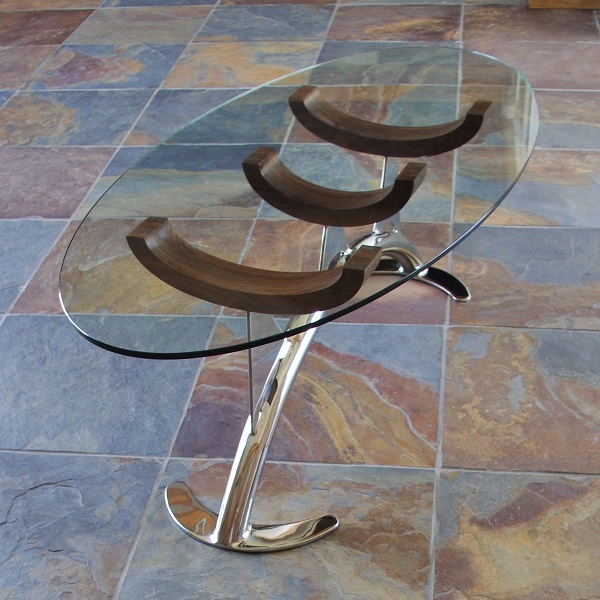 Coffee table top is oval 12mm toughened glass. Dimensions (cm) – H 53 | L 160 | W 80 (oval top).